Une nouvelle mouture de l'anciennement Dark Millenium est en train de voir le jeu. Sortie prévu fin 2015... on a le temps de le voir venir ! Wait and see, je pense que l'on aura une idée du jeu quand il y aura quelques infos à se mettre sous la dent. Personnellement depuis WAR j'ai arrêté d'y croire ^^ et puis LOTRO me comble amplement. Les quatre races sont dévoilées : Orcs, Eldars, Space Marines & Marines du Chaos. Particulièrement pour les Space Marine seront jouables les Ultramarines, les Blood Angels, les Space Wolves ou les Dark Angels. Warhammer 40,000: Eternal Crusade is a 3rd-person, PvP-focused, Action MMORPG. Players select one of the factions of the 41st millennium and fight for control of a persistent world, claiming territory in massive battles and hacking their way through procedural content while earning the right to customize their characters in a deep progression system drawn from Warhammer 40,000 lore. Eternal Crusade's combat is fully action-based, meaning that you hit exactly where you shoot or swing and it's up to your skill whether you pull off a headshot or block that incoming chainsword. In addition, gamepads will be fully supported. Both ranged and melee weapons have equal emphasis – as in the iconic battles of Warhammer 40,000, combat begins at a distance with guns and heavy vehicle-mounted weaponry before progressing to bloody blade-on-blade action with brutal executions. What business model will the game use? Although it’s still under consideration, the current plan is that Eternal Crusade will be “premium with a free-to-play option.” By purchasing a copy of the game, you will have access to it forever with no need for a subscription. There will be post-launch expansions, as well as a cash shop for customization & convenience items. If you don’t want to buy the box, you can still try the game as a free-to-play version of an Ork character. As opposed to the premium Orks, your progression will be slower and some options will be locked off, but you’ll be able to go anywhere and fight for the Waaagh! If you like it but still don’t want to pay the full price, you can unlock some of the missing options with microtransactions. At launch, there will be Space Marines, Chaos Space Marines, Orks and Eldar. Tyranids will also be in the game, but only as NPCs. We aim to release the rest of the races from the universe over the lifetime of the game. 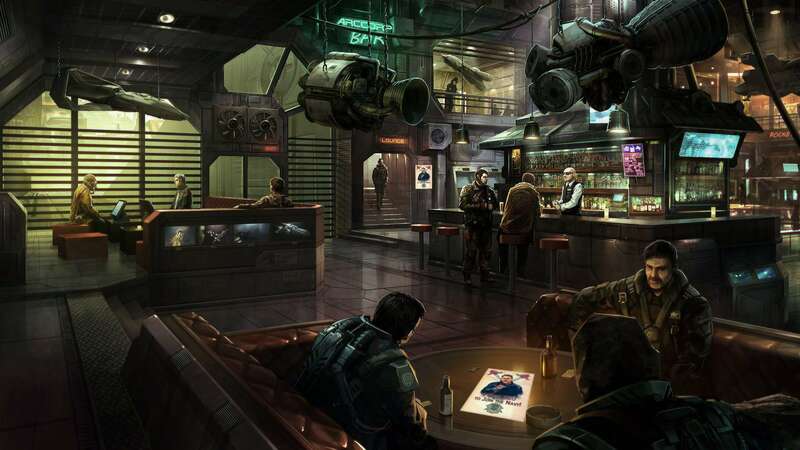 Players may make characters in multiple factions, but non-combat interactions between factions are extremely limited. All the factions are unique and opposed to one another in their goal to conquer the planet! Are there different Chapters, Craftworlds, Clans, etc.? Yes, when you create your character in a faction you also choose one of that race’s sub-factions to identify with. Space Marine chapters at launch include (at least) the Dark Angels, Ultramarines, Blood Angels and Space Wolves. Expect more information on the rest of the factions over the course of development. Not in the traditional sense. Instead of looking for quest-givers to give you things to do, you can just head out into the world to find procedurally-generated content in your own or the enemy’s territory. We’re currently working on short, horde-style firefights and longer dungeon-delving experiences. In both cases, the content will be randomized so it’s new every time, but with parameters and details specific to the locations. Of course, you can always look to the community channels and your faction leaders to get some direction. In addition, there are mid- and long-term opposed goals for factions that appear on a regular basis as part of the campaigns. More details on this soon! Solo players can easily find and join battles with their faction by either looking at the world map or deep striking into the top conflicts of the moment. They will also be able to access and progress through procedural content – it will definitely be a challenge, however! No! As in the game, you’ll pick what unit class type you want to bring to the battlefield and have access to a huge amount of customization, but since this is a PvP-focused game the progression won’t be primarily about increasing power, but rather gaining access to a wider variety of skills and better specialization. Certain powerful but limited unlockables will be available to truly dedicated players, however. More details on this soon! What classes are in the game? Each faction features a unique selection of classes drawn from their lore, and each character in a faction has the opportunity to choose from a variety of classes when they deploy on the field. For the Space Marine faction, a few of the classes you can choose from include Tactical Marines, Devastators, Assault Marines, or Apothecaries (Wolf Priests in the case of the Space Wolves). Check out their codices if you want to speculate - more details soon! Will there be trading and crafting? Yes, in a form that fits with the Warhammer 40,000 universe. You won’t be able to be a “crafter”, but there is an extensive upgrade system for weapons. Will I be able to customize my characters' appearance and color scheme? Yes! More details on this soon. The Battle Squad is the core of the game. With friends (old or new), you’ll be able to create and earn rewards for your small community and then join Strike Forces made up of many Battle Squads. Strike Forces are the pillars of their factions and will make a huge impact in the gameworld. As a team, you will traverse the landscape in various modes of transportation and participate as a unit in territory conflicts, or seek out and fight together against Tyranids and other forces in various forms of procedural content. Are there any player- or community-owned spaces? Yes – different levels of community may own different types of spaces on ships in orbit. Details on this soon! We can’t say quite yet, but there will definitely be both closed and open beta phases. Sign up on this site to get access details first! Warhammer 40,000: Eternal Crusade is being developed for PC and next-gen consoles. Bon on apprend quelques petites choses : déjà c'est un jeu orienté RvR, si je ne me trompe pas il n'y a pas de faction chaque race sera indépendante et pourra taper sur les autres. Chaque race comportera des factions/chapitres/clans/etc... et surtout des classes uniques (ex: Space Marine Tactique, Devastator, d'Assaut et Apothicaire (Prêtre Loup pour les Space Wolves)). Si j'ai bien tout compris le la progression des personnage ne se fera pas par niveaux et il n'y aura pas à proprement parlé de quêtes dans le terme classique des MMO enfin le craft ne sera pas vraiment du craft. Le jeu devrait sortir sous une forme Free2play avec possibilité d'abonnement. Ca reste très évasif dans les nouvelles qui sont données mais il y a tout de même quelques premiers éléments intéressants.